Autograph mathematics software uses a dynamic, interactive, and visual approach to promote a deeper understanding of fundamental mathematical concepts. It is both an instructional tool for teachers and an investigative and learning tool for students. Autograph is a complete dynamic environment for the secondary and college level mathematics classroom Ideal for graphing and geometry (2D and 3D), statistics and probability, Autograph supports plotting in all three dimensions. 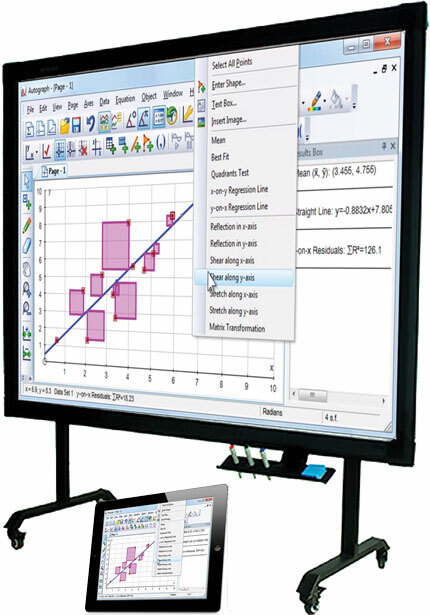 This powerful teaching tool, designed to help teachers and students "visualise mathematics", is popular with classroom teachers both for demonstration purposes and for interactive use by students. Teaching mathematics with dynamic software is more effective, more efficient and more fun for both teachers and students. Autograph has had a major make-over, with a fresh new design. Many new mathematical objects have been introduced in both 2D and 3D, and for each object there is an associated list of 'attributes'. The most dramatic features of the new Autograph 4 involve these attributes, which can selectively be used in the new "attribute calculator", or the new "XY" attribute point plot. There is also a ground-breaking new "Argand Diagram" page, enabling complex numbers to be explored through dynamic objects. Autograph offers teachers and students alike the opportunity to bring the subject to life through the manipulation of dependent, selectable, mathematical objects. Ideal for graphing and geometry (2D and 3D), statistics and probability, Autograph supports plotting in all three dimensions. Scatter diagrams: Cartesian, parametric and polar graphing; differential equations (1st and 2nd order); coordinate geometry; vectors, transformations, matrices; animations; unique slow plotting mode; animation of constants and mathematical objects. Coordinate geometry: points, lines, planes surfaces, vectors cross product; intersections; Cartesian, parametric and polar graphs. Dynamic transformations of solid shapes with full camera and lighting control. Enabling complex numbers to be explored through dynamic objects. Built-in 3 minute tutorials from Year 7 to advance calculus show you how. World beating 3D interface: lines, planes volumes of revolution. Greatly admired section on probability and statistics. Autograph is the only software to let you visualise maths in 2D and 3D with ease. There are no arcane commands to learn - just point and click. Left click to select an object and right click for a context sensitive menu of mathematical actions. With Autograph, it's just you and the maths. You are free to go wherever enquiry takes you! There's lots of educationally world data on the Autograph website, and you can also import data from anywhere on the web, or from Excel and other sources. All imports go directly into Autograph via a simple copy and paste technique. You can also represent, manipulate and analyse your data dynamically in Autograph with mathematical rigour and precision. Proper histograms are offered for example, with variable class interval widths - then copy and paste into Word documents to print and share, or save it as a web page. Use photos or images as backgrounds to bring STEM topics to life. 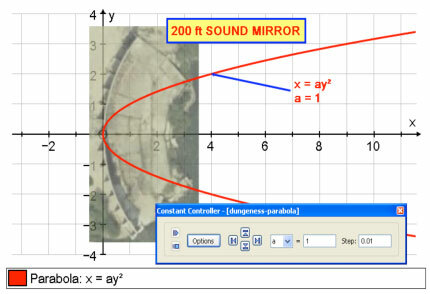 You can make maths even more dynamic by adding photos and images as your background. Import any graphic image, adjust the opacity so you can see your graphed model clearly, and fit functions to natural phenomena. Whether it be fitting a quartic through five points to find the equation of an arch, or the trajectory of a projectile, or geometric features of architecture, the procedure is totally straightforward. Altogether it is a great way to relate maths to real world phenomena and engage attention. In Autograph 3.3, image handling has been improved: you can paste or drag image files into Autograph, and you can drag images straight off Firefox pages. What’s more geometry has been expanded, with new angle measurement tools and marking. Indeed text annotation is now dynamic too. There's a dockable results box, tabbed workspaces and a redesigned and an expanded Help and Training system. It's a great time to upgrade. Autograph allows you to explore secondary and college maths dynamically and with ease - no matter what the size of screen. The program’s whiteboard 'scribble' and 'rubout' tools belong to Autograph, so the writing does not disappear (as it can do on most whiteboards). Additionally 'Whiteboard Mode' provides large writing and thick lines - so they can be seen no matter where students are seated in the classroom. Every maths teacher in your school can learn to use Autograph within the hour. For specific issues, the built-in 3 minute tutorials cover each topic from basic Year 7 maths to advanced calculus. The intuitive interface for both teachers and students allows you and the class to focus on maths - there's no programming. This is also the only software with the “Slow Plot” option: an essential tool to assist learning. Plus we have the “Dynamic Constant Controller” so you can see changes on the fly, step by step or in one go. 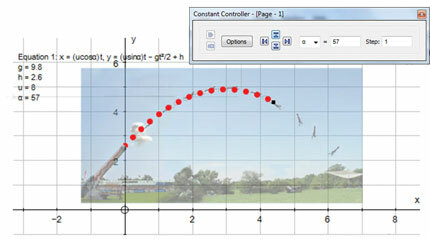 And then there is the Dynamic Animation Controller which brings all the maths herein to life. Single User Licence - for use on 1 computer. 50-User Licence - use on up to 50 specified computers on one site, includes staff use at home. SITE Licence - unlimited number of users, includes all teachers and students, on and off campus. Annual SITE Licence - use on an unlimited number of computers simultaneously, on one single geographical site of a school, college or university, includes staff and student use at home. Upgrades from previous versions (3.2 and 3.3) also available. Please ask for pricing. Software is supplied by download, then online activation.